A prelude to a shift in human consciousness. Thoughts and emotions this man feels as the time approaches. The album I always felt I’d make since I started this Hip Hop thing. Take it for free, give it to your friends and family, I just hope it is heard. Dedicated to everything in existence, which I hope to bring together, fostering a harmonious relationship. To all those in my life, from those closest to me to mere passerby’s, I appreciate everything you have done. Good or bad, it has led me to this, and I cannot thank you enough, but I’ll say it anyway. Thank you. Remember, your essence is Love. You are highly capable. The greatest change comes from within. Every decision is an opportunity. Every challenge is an opportunity. “All my music is an attempt to connect and relate to the very people I have connected with over the years, so I am sure those who peep through the rest of my catalogue can find a great deal of positivity in my lyrics. I even recently released a concept album based on the Batman villain Ra’s al Ghul, an ecoterrorist. Even as violent as it seems, the ultimate conclusion I try to point out is that even a ruthless ecoterrorist knows the best way to a better world is through love and peaceful means. 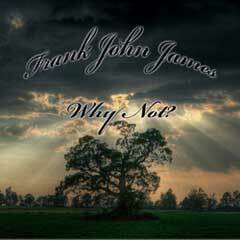 Visit Frank’s Website http://frankjohnjames.bandcamp.com/album/why-not for an immediate download of 17-track album in your choice of MP3 320, FLAC, or just about any other format you could possibly desire. Frank John James is an MC/Producer, born and raised in Santa Barbara, CA, perfected in Los Angeles. Represents Earthworms with MC Braiiinstorm, who together with MC Mas1 form the trio Stereotype. This entry was posted in Reviews, Books, Music, Apps and tagged beliefs, consciousness, diet, love, new age, new age blog, new age music, positivity, spirituality. Bookmark the permalink. ← The Year Of The Water Snake – What Does it Mean for You?